Looking for a great podcast on CRISPR? Check out RadioLab – they also have a captivating one on patient zeroes throughout history! If you’re looking to learn more about global health security, synethic biology, biosecurity, and what exactly “biodefense” entails, you’ll want to mark your calendar for the GMU Biodefense three-day, non-credit summer workshop on July 17-19, 2017! Participants will look at the challenges facing the world at the intersection of national security, public health, and the life sciences. Instructors for the workshop range from FBI special agents to biodefense professors and USAMRIID commanders. The workshop will look at the spectrum of biological threats – including naturally occurring disease outbreaks such as SARS, Zika, and Ebola, lapses in biosafety, dual-use research of concern, and the threat of bioterrorism. From now until May 1st, you can take advantage of the early bird registration discount! GMU biodefense PhD alum Daniel M. Gerstein is emphasizing the need to strengthen American biodefense capabilities. “Recent legislation has called for a comprehensive biodefense strategy. If carried out in a thorough and systematic way, and properly funded, this will be a great improvement for the country and the world.” Gerstein notes that while the National Defense Authorization Act for Fiscal Year 2017 called for a joint biodefense effort, there is still a desperate need for a structured and systematic approach. 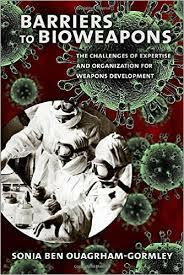 Perhaps one of the biggest issues Gerstein found is the current view of biodefense as a series of programs. Approaching global health security threat requires us to view biodefense as a complex system, not a series of programs. To fix the glaring gaps in U.S. biodefense efforts, he notes that any remedy will have to accept the complexity of the problem and that there is no single panacea. Internal coordination, improvement of diagnostics and treatment, and technology management are all things that must be addressed to strengthen American biodefense. “Export controls in the United States, for example, actually hinder international collaboration. Exchanging pathogen strains used in the development of medical countermeasures, diagnostics, and bio-surveillance remains difficult – even, at times, for close international partners. In one case, the United States was attempting to share a strain of the Ebola-Reston pathogen with the government of Australia, but export laws prevented this sharing, so the strain was instead acquired from the Philippines, where the strain originated.” While we’ve made great strides since the Amerithrax attacks, there is much to be done to create a systematic and resilient biodefense strategy. The WHO has recently activated an emergency response plan with several partners to help treat twelve people for potential exposure to chemical weapons in Iraq. “Lise Grande, the UN humanitarian coordinator in Iraq, called for an investigation. ‘This is horrible. If the alleged use of chemical weapons is confirmed, this is a serious violation of international humanitarian law and a war crime, regardless of who the targets or the victims of the attacks are,’ she said in a statement.” Many are pointing to ISIL as the likely culprit since they hold the majority of west Mosul and have a history of rudimentary use of chemical weapons. Despite a recent surge in human A(H7N9) cases, the WHO has stated that the risk of an epidemic remains low. Even with this release, the development of two distinct strains in a disease that has a mortality rate hovering around 30%, has many worried. “That will probably force development of a second small stockpile of emergency vaccine to be rolled out if the virus becomes more transmissible and threatens to turn into a pandemic, a scientist at the Centers for Disease Control and Prevention said. Flu specialists from around the world gathered in Geneva this week to assess the global influenza situation and discuss with vaccine companies which viral strains should be in next winter’s flu shots. China has had 460 lab-confirmed human cases of H7N9 bird flu this winter, said Dr. Wenqing Zhang, head of the W.H.O.’s global influenza program. That is the most in any flu season since the first human case was found in 2013.” Interestingly, around 7% of the new H7N9 cases were resistant to drugs like Tamiflu, which has many researchers working to make a H7N9 seed vaccine, including a secondary one due to the split strains. Coming on the heels of this outbreak, US officials have announced that highly pathogenic avian influenza (HPAI) was found in a commercial poultry farm in Tennessee. 700 birds died from infection and almost 73,000 were destroyed. The farm is a contracted supplier of chicken meat for the U.S.’s biggest supplier, Tyson, which released an announcement on March 5th regarding testing of local birds, etc. Johns Hopkins Center for Health Security recently received a grant from the Open Philanthropy Project and the Robertson Foundation to coordinate with the Nuclear Threat Initiative (NTI) and the Economist Intelligence Unit (EIU) to develop a Global Health Security Index. “The mission of the index is to encourage progress towards a world that is capable of preventing epidemics of international impact (either natural, accidental or deliberate) from arising, or, should, prevention fail, respond quickly to contain them.” The first phase of the project will aim at developing framework that can measure a country’s level of health security. While the GHSA and JEE are processes to increase transparency, preparedness, and country capabilities, the goal of this index is to fill the gaps in motivation and also the factors that are not in the hands of the health sector. Antimicrobial Resistance in Pets: Are We Ignoring A Looming Threat? GMU biodefense PhD student Saskia Popescu is looking at the threat of antibiotic resistance, but from a somewhat forgotten patient population – our pets. The recent WHO list of worrisome antimicrobial resistant bugs has drawn a lot of attention to the growing threat of an antibiotic apocalypse however, sometimes it takes a personal experience to look outside the box. Pulling from experiences of dealing with drug resistance in her dog to the loss of SeaWorld’s controversial orca, Tilikum, Popescu notes the rising threat of AMR brewing in domesticated animals. Sadly, it seems that many veterinarians and infectious diseases researchers have been drawing attention to the role of household animals in antimicrobial resistance and yet, just like the human issue, it’s not getting the attention it deserves. In her article, Popescu points to the need to start addressing the full circle of microbial resistance, starting with our furry friends. Constraining Norms for Cyber Warfare Are Unlikely – GMU Biodefense PhD alum, Brian M. Mazanec, is talking to the Georgetown Journal of International Affairs about the realities of norms for cyber warfare. The question of whether constraining international norms for cyber warfare will emerge and thrive is of paramount importance to the unfolding age of cyber conflict. Some scholars think that great powers will inevitably cooperate and establish rules, norms, and standards for cyberspace. While it is true that increased competition may create incentives for cooperation on constraining norms, Mazanec argues that norm evolution theory for emerging-technology weapons leads one to conclude that constraining norms for cyber warfare will face many challenges and may never successfully emerge. All this rain and grey weather (at least in DC) makes us want to curl up with a good book and luckily, we’ve got just the reading list! This week we’re sharing some top-notch work by our phenomenal faculty and alumni for you to enjoy. Earlier this week, straight out of a James Bond movie, Elon Musk presented Tesla’s Model X and its Bioweapon Defense Mode. Google had its 2015 Science Fair and a pretty amazing high school student took home top honors for her work on Ebola. Did I mention Kansas is prepping for the zombie apocalypse? Needless to say, there was a lot going on this week in the world of biodefense, so let’s venture down the rabbit hole…. I’m thinking we may need to take a class trip to Kansas since Governor, Sam Brownback, will be signing a proclamation to officially designate October as “Zombie Preparedness Month”! Brownback’s rationale is to emphasize preparedness in any form, stating, “If you’re prepared for zombies, you’re prepared for anything. Although an actual zombie apocalypse will never happen, the preparation for such an event is the same as for any disaster: make a disaster kit, have a plan, and practice it.” During Zombie Preparedness Month, state emergency management services will have activities and information for residents to help get their preparedness on. They’ll also be using social media to engage people people on these topics. The one thing we’ve learned in biodefense, Gov. Brownback, is to never say never! High school junior, Olivia Hallisey, just took home the Google Science Fair top prize for developing an affordable and easy Ebola test in her project, “Ebola Assay Card”, which quickly (we’re talking 30 minutes quick!) detects the virus and doesn’t require refrigeration. Each test only costs $25 and picks up antigens on photo paper. Hallisey summarizes, “In this new device, that is stable and stored at room temperature, 30µl drops of water were used to dissolve silk-embedded reagents, initiating a timed-flow towards a center detection zone, where a positive (colored) result confirmed the presence of 500pg/ml Ebola(+)control antigens in 30min, at a cost of $25,” Hallisey hopes this project will encourage other girls to pursue their passions in science. Hallisey is truly an inspiration and we tip our hats to her passion for solving world problems while encouraging her peers! Come listen and chat with Dr. David R. Franz, former commander of USAMRIID, about balancing research and regulations when it comes to dual-use! ​Dr. Franz was the Chief Inspector on three United Nations Special Commission biological warfare inspection missions to Iraq and served as technical advisor on long-term monitoring. He also served as a member of the first two US-UK teams that visited Russia in support of the Trilateral Joint Statement on Biological Weapons and as a member of the Trilateral Experts’ Committee for biological weapons negotiations. He previously served as member of the National Science Advisory Board for Biosecurity (NSABB). Dr. Franz currently serves on several committees including the National Academy of Sciences Committee on International Security and Arms Control and the National Research Council Board on Life Sciences. Dr. Franz is a leader in the areas of cooperative threat reduction and health security and an expert in the development of U.S. regulations for biological threat reduction and biological security. Dr. Franz will discuss the history and current debates related to U.S. and international regulations for select agents, dual use research of concern, and gain-of-function experiments. Dr. Martin Furmanski discusses the gain-of-function (GoF) research hazards in relation to the 1977 H1N1 strain and it’s laboratory origins. Highlighting a previous article on the GoF debate, Dr. Furmanski notes that “separating the risks of vaccine development from those of basic GoF research is inappropriate, because GoF research seeks to discover antigenic and genomic changes that facilitate human-to-human transmission and/or augment virulence, with the aim of preemptively producing vaccines.” He also notes that while the 1977 H1N1 epidemic originated in a lab and it’s release was unintentional, the culprit laboratory matters little in the GoF debate. GMU Biodefense alum, Dr. Daniel M. Gerstein, discusses the US-China cybersecurity agreement and the Friday announcement between Chinese Premier Xi Jinping and President Barack Obama. The agreement highlights the mutual desire to prevent cybertheft of business secrets. Dr. Gerstein emphasizes that while this agreement is a step in the right direction, it points to larger preparedness and response capability gaps. He notes, “So while a U.S.-China agreement is a welcome step, it also underscores the greater issues facing the United States, and indeed the international community, in this largely ungoverned space.” Dr. Gerstein highlights the necessity to define cyberspace boundaries, especially as there are delays in DHS security system deployments while US vulnerabilities continue to develop. As of September 24, 2015, all institutions and USG funded agencies are now required to comply with the policies. Agencies now must have “a mechanisms in place to evaluate research that is potentially Dual Use Research of Concern (DURC).” Institutions must also organize an Institutional Review Entity (IRE) to review and manage compliance with these requirements. Dr. Sonia Ben Ouagrham-Gormley’s new book, Barriers to Bioweapons, received glowing reviews in the latest issue of Perspective on Politics. Her work, which is a staple for biodefense courses, and particularly this text, focusses on the perception of risk and lethality of bioweapons while addressing the realities of these assumptions. Ouagrham-Gormley discusses the key role of tacit versus explicit knowledge in the development and dissemination barriers for bioweapons. “The author identifies important factors internal to a weapons-development program- talented individuals and cohesive groups, corporate culture, communities of practice, organization structure- as critical nodes or ‘reservoirs’ of knowledge that must be configured to optimize the sharing of ideas and information.” The case studies of Iraqi and South African programs, as well as Aum Shinrikyo, lay the foundation for her points on the role of internal and external variables that can hinder or help a bioweapons program. Whether you’re reading it for class (GMU Biodefense folks, I’m looking at you!) or you’re looking to brush up on nonproliferation, this book is a well-written and captivating necessity to understand bioweapon development. Did I mention how awesome the cover is? Our very own GMU Biodefense PhD alum, Dr. Denise N. Baken, has a wonderful new book being released – let’s check it out! Al Qaeda : The Transformation of Terrorism in the Middle East and North Africa examines violence and the way it is marketed by the global terrorism industry. Authors Denise Baken and Ioannis Mantzikos frame the violence discussion through the prism of its use by Al Qaeda, Al Qaeda in the Arabian Peninsula (AQAP) and Islamic State of Iraq and Syria (ISIS).Baken and Mantzikos look at the business parameters of violence –its cost, return on investment, efficiency, and effectiveness; They propose a new approach to that violence. One that looks at violence as a controlled commodity that evolved from Al Qaeda’s initial presentation of future possibilities, AQAP exploited those possibilities and ISIS pushed the boundaries of usability. Tesla’s New Model X Comes Equipped With a Bioweapon Defense Mode! Elon Musk announced on Tuesday, along with other features, the new car will have innovative air filters that can eliminate almost all harmful bacteria and particulates from the cabin. Coined the Bioweapon Defense Mode, it’s capable of air scrubbing to the point of operating room air standards. Now you just have to worry about what happens when you need to charge the car….maybe the glove compartment has a Tyvex suit ready to go? Well, I guess if the zombie apocalypse happens we won’t need to worry about electric cars. Kansas City Shigella Shuffle –Kansas City, Missouri is seeing a spike in their Shigella cases this year. Their annual incidence is roughly 10 shigellosis cases, however, this year they have reported over 150 cases already. Interestingly, 134 of these cases have been identified since July 1st. Epidemiologists are currently investigating the source for such a spike. Geographical Scope of Antimicrobial Resistance– The Centers for Disease Dynamics, Economics, and Policy (CDDEP) just released new interactive maps that show antibiotic resistance trends by country. The alarming notions are the high resistance rates in low and middle income countries. National Science Advisory Board for Biosecurity September 2015 meeting is available via video! Check out the federal advisory committee’s recent meeting to discuss a variety of biosecurity issues involving molecular biology, dual use, infectious diseases, etc. In March, CIA Director John Brennan announced his plan for restructuring the Central Intelligence Agency in his “Blueprint for the Future”—the unclassified version of which is available on the CIA’s website. The plan, structured as a memo to CIA personnel, provides a broad overview of the coming administrative changes proposed by Brennan’s Study Group. Brennan identifies two key areas of national security that prompted the changes: “The first,” Brennan says, “is the marked increase in the range, diversity, complexity, and immediacy of issues confronting policymakers; and the second is the unprecedented pace and impact of technological advancements.” New issues and new technology seem like pretty common themes in Washington these days. Let’s look at what Brennan plans to do about them. To respond to these policy areas, the memo outlines four themes: enhancing talent and human capital, addressing the digital revolution, modernizing the business process, and integrating capabilities to address mission areas. I’ll talk mostly about the digital and integration themes here. U.S. Cyber Command (USCYBERCOM)—a joint military command co-located at Fort Meade, Maryland, with the National Security Agency (NSA), the primary signals intelligence agency—represents the bulk of U.S. cyber presence right now. The CIA’s history of covert actions and the existence of a military cyber command raise concern over whether the U.S. is developing simply cyber defenses or cyberwarfare capabilities. The best evidence for the latter is the Stuxnet computer worm, discovered in 2010, which targeted Iranian nuclear equipment and is largely attributed—at least partially—to the U.S. The creation of a new CIA directorate devoted entirely to cyber activities is a response to the overwhelming academic and industry consensus that the cyber domain poses imminent threats to the U.S. However, the new directorate isn’t unique, given the existence of USCYBERCOM and the NSA, and might represent the condensing of existing CIA cyber activities into a single structure. It is hard to glean any details about the CIA’s cyber intentions moving forward, but the new directorate is a major organizational change and a huge signal that the government is continuing to respond to the rise of the cyber domain. Speaking of consolidating activities, Brennan also announced the creation of new Missions Centers and changes to existing directorates. Citing the need to address varying threats and U.S. national security interests, Brennan explained that Mission Centers, each led by an Assistant Director, will incorporate activities from across the agency to address a specific topic. Functionally, this seems to mean that Brennan intends to close the long-standing divide between analysis and covert action that has defined the CIA since its inception, and he has announced administrative changes to support this. The National Clandestine Service, which runs all of the CIA’s undercover activities, will be renamed the Directorate of Operations, and the Directorate of Intelligence will become the Directorate of Analysis. While these seem like minor name changes, they reflect the greater forces at play—Brennan intends for the directorates to train quality operatives and analysts to contribute to the Mission Centers. The Assistant Directors will have “accountability and responsibility for the delivery of excellence in their respective occupations across all of the Centers.” This setup seems to be modeled on the National Counterterrorism Center or the Bin Laden unit, crosscutting organizations within the intelligence community that combined strengths from many disciplines. This will, however, take a great deal of proactive administrative attention to ensure that cooperation and coordination are paramount. Shared missions are powerful motivator, but they are often not enough to convince large organizations to coordinate successfully. This will take time and a great deal of work at every level. A focus on personnel runs throughout the memo. While it might not seem this way to current graduate students and job seekers, the CIA has historically had major problems attracting qualified, competent employees, especially following the fall of the Soviet Union, when the agency found itself flooded with Soviet experts and woefully unprepared to address the host of new threats and interests around the world. The CIA has had a long and often sordid history (I highly recommend Tim Weiner’s Legacy of Ashes for a comprehensive look), and often found itself the target of harsh criticism by Congress and the presidency, but Brennan seems to be targeting major, long-standing flaws with his reform plan. This is a laudable, noble pursuit, and I hope it has a positive impact. The intelligence community usually sees its soul searching come after major failures or during times of national crisis. Coming on the tail of revelations about U.S. interrogation programs, these changes seem to aim to fix the system before disaster strikes again (though it is certainly accurate to call the decade-plus of detention and interrogation abuses a disaster). Let’s hope Brennan’s plan is sound.